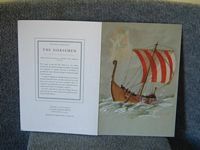 DESCRIPTION -- Ships log/last voyage menu from the Andes dated 1953 and is in a great condition (click on the picture for a view of the inside). DESCRIPTION -- Dinner menu from the SS Canberra from the P&O Line shipping company and is in a fantastic condition and is dated 1st August 1993 (click on the picture to see the inside of the menu). HISTORY -- For almost 40 years Canberra served the Peninsular & Oriental Steam Navigation Company (P&O) admirably. Canberra started her illustrious career in 1961, taking emigrants to a new life in Australia, but as global transportation and travel habits evolved, so did Canberra in order to survive. DESCRIPTION -- Menu from the famous old vessel The SS Canberra from the P&O Line shipping company which is dated Friday 5th May 1989 and is in great condition and original from the vessel. 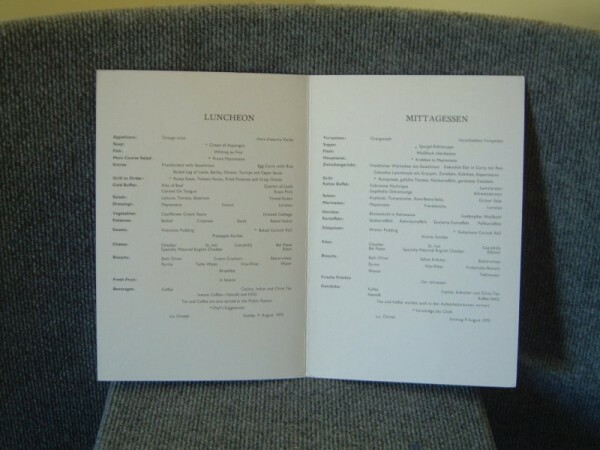 DESCRIPTION -- From the P&O Line vessel the Corfu and is an original ship dining menu. 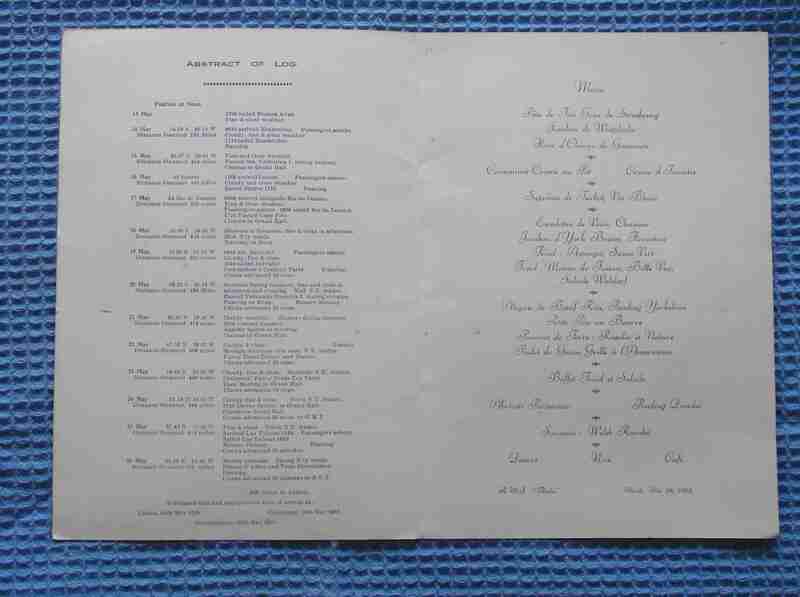 It is a rare find from this vessel and it is dated Sunday 30th January 1938 and is in a very good condition showing the menu for breakfast, luncheon and dinner. HISTORY -- RMS Corfu was a Royal Mail Ship and ocean liner operated by the Peninsular and Oriental Steam Navigation Company. Known as one of the 'Far East Sisters', she was launched in 1931 to serve the company's India and Far East Mail Service, along with her sister ship, the RMS Carthage. Both ships were built by Alexander Stephen & Sons Ltd in Glasgow, Scotland and served from 1931 until 1961 when they were scrapped in Japan. DESCRIPTION -- Dinner menu from the SS Canberra from the P&O Line shipping company and is in a fantastic condition and is dated 2nd December 1991 (click on the picture to see the inside of the menu). HISTORY -- The SS Canberra is one of the most famous ships of the P&O Line. In the early 1970's she was almost scrapped as the need for passenger liners diminished. Air travel was becoming ever cheaper and oil prices were increasing dramatically. A last minute reprieve saw the ship transferred to the growing cruising market. She never looked back. In 1982 Canberra became an national heroine as she transported British troops into the war zone of the Falkland Islands. After the conflict, "The Great White Whale" as she had become known, returned home to a fantastic welcome in Southampton. 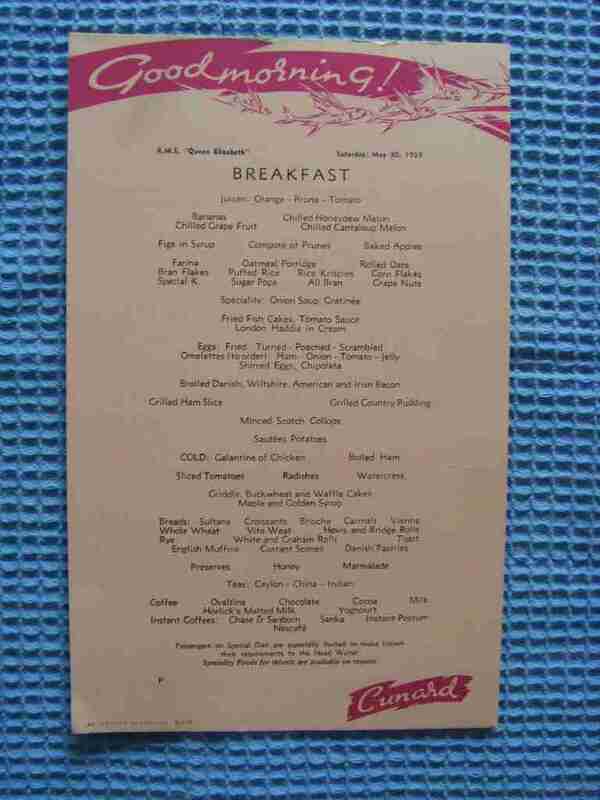 DESCRIPTION -- Breakfast menu from the Cunard Line vessel the Queen Elizabeth and is in a good condition and is dated Saturday 30th May 1959 (click on the picture to see a closer view of the menu). DESCRIPTION -- Dinner menu from the SS Oriana from the P&O Line shipping company and is in a fantastic condition and is dated 30th June 2000 (click on the picture to see the inside of the menu). HISTORY -- SS Oriana was the last of the Orient Steam Navigation Company's ocean liners. She was built at Vickers-Armstrong's, Barrow-in-Furness, Cumbria, England and launched on 3 November 1959 by Princess Alexandra. Originally resplendent with her owners' traditional corn coloured hull, Oriana appeared as an Orient Line ship until 1966, when that company was fully absorbed into the P&O group. Faced with unprofitable around the world passenger routes, the P&O white hulled Oriana was operated as a full-time cruise ship from 1973. 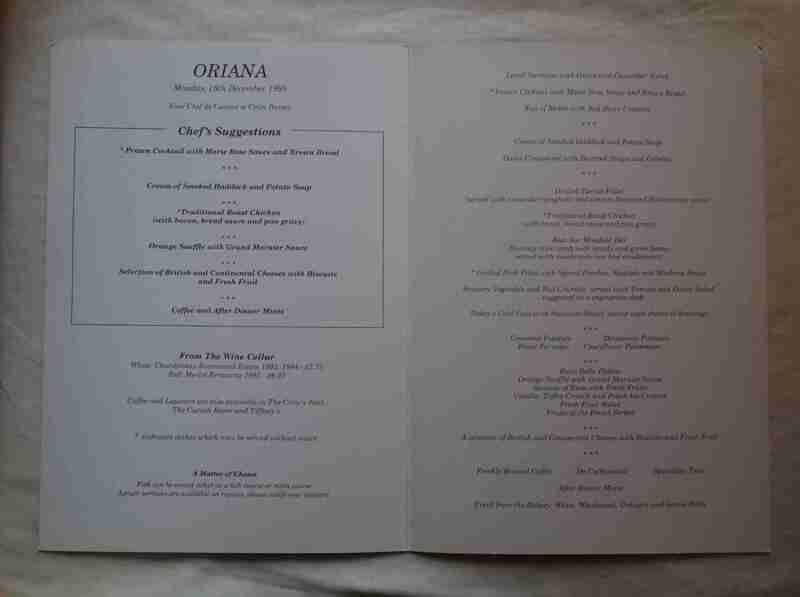 DESCRIPTION -- Dinner menu from the SS Oriana from the P&O Line shipping company and is in a fantastic condition and is dated 18th December 1995 (click on the picture to see the inside of the menu). 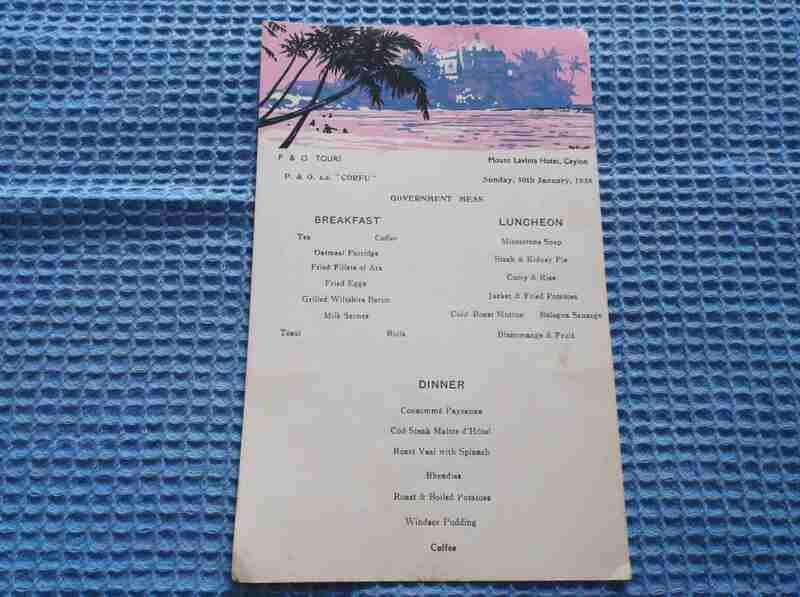 DESCRIPTION -- Luncheon menu from the Chusan from the P&O Line shipping company and is in a fantastic condition and is dated August 1970 (click on the picture to see the inside of the menu).